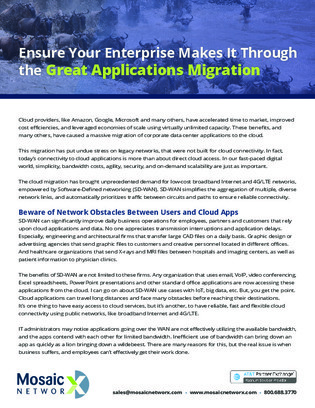 The great enterprise migration to the cloud is upending traditional legacy WAN connectivity. SD-WAN, with cloud network intelligence, enables IT teams to simplify network infrastructure, easing the mass cloud migration. Download this white paper to learn more about SD-WAN, and how it can help you achieve Internet connectivity that’s fast, low cost, and widely available, while minimalizing unpredictability, latency, and security risks.